The Canada C3 expedition, a 150-day journey from coast to coast to coast, has inspired a song entitled “River of Nations”. 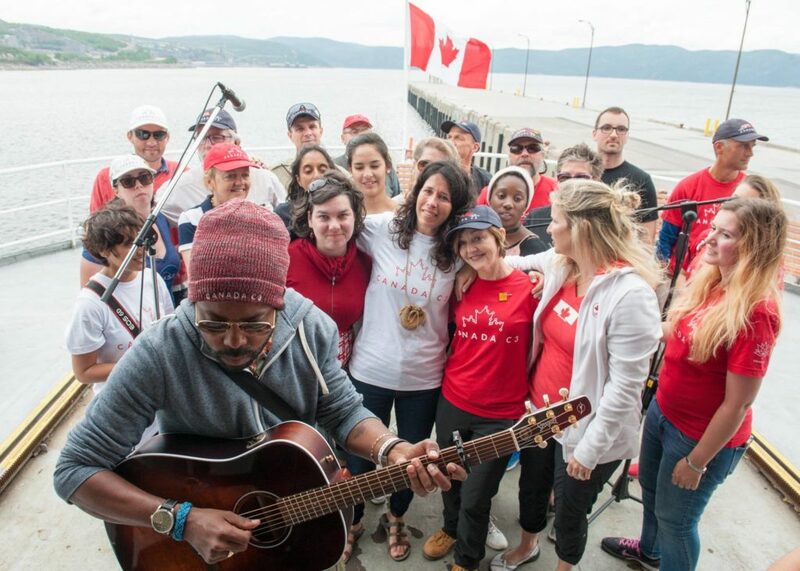 Written and performed by Alex Cuba, Andrea Menard, Heather Rankin and participants on board the Canada C3 ship, “River of Nations” combines English, French, Mohawk and Spanish lyrics to describe the Canada C3 experience. Joining Cuba, Menard and Rankin on the song are Dardia Joseph, the Canada C3 Youth Ambassador for leg 2 and Tiio Horn, a leg 2 participant from Kahnawake. Other leg 2 participants also join in on the song’s chorus. Cuba, Menard, Rankin, Joseph and Horn joined 19 more Canadian participants from across the country on Leg 2 of the Canada C3 expedition, which took them from Montreal to Baie Comeau, with stops in communities including Kahnawake, Trois-Rivières, Québec City, Wendake, l’Islet and Rimouski. Each leg of the Canada C3 expedition features a cross-section of Canadian society, including Canadian musicians, visual artists, scientists, journalists, youth, authors and more. “River of Nations” was recorded in June 2017 in a makeshift studio on the Canada C3 ship, a former Canadian Coast Guard icebreaker, as it sailed from Rimouski to Baie-Comeau. It premiered in front of thousands on July 3, 2017 at Stanfest in Canso, Nova Scotia. Alex Cuba was raised in Artemisa, an hour outside of Havana, and now calls Smithers, B.C. home. With over 20 awards and nominations to his name, including four Latin Grammys and two Junos Awards, Alex Cuba is currently touring and promoting Lo Único Constante, released April 7, 2017. Andrea Menard is an accomplished Métis singer, actress and speaker who crosses cultural and language boundaries by speaking from her heart. One of the stars of the Netflix series, Blackstone, Andrea has released four award-winning cds, has written and starred in two television programs and has performed and spoken all over the world. Heather Rankin is a singer, songwriter, actor who is best known as the youngest member of the multi-platinum selling, multi award winning musical group, the Rankin Family. Her recent debut solo recording, A Fine Line, was nominated for a Juno and two East Coast Music Awards. Kaniehtiio Tiio is a Mohawk woman from Kahnawake. She’s a scorpio and also a member of the bear clan. She has spent the last 12 years working as an actress in Canada and the US, and has recently appeared in Letterkenny and the Royal Canadian Air Farce Canada Day special. A Haitian woman determined to become an agent of change, Dardia Joseph wants to make a difference for marginalized populations by democratizing access to democratic institutions. Building on the effectiveness of the arts as a vehicle for social consciousness, she uses means of expression such as poetry to advocate for the ideals of social justice and equality.